TORONTO, Tuesday, April 17, 2018 – York University will lead an international research collaboration to calculate how well countries are managing their natural resources and meeting their United Nations Sustainable Development Goals. The University has been chosen by California- and Switzerland-based non-profit Global Footprint Network to produce its National Footprint Accounts. These accounts show each country’s ecological footprint or overall demand on nature and the biocapacity of nature to regenerate. The collaboration will be announced at 12:30pm today in Ottawa (Room 430, Wellington Building, 180 Wellington St., Ottawa) at a reception for parliamentarians and senators hosted by MP Joyce Murray, MP Linda Duncan and Green Party Leader MP Elizabeth May. York University’s Faculty of Environmental Studies Dean Ravi De Costa and Professor Emeritus Peter Victor will be on hand. Mathis Wackernagel, co-founder and CEO of Global Footprint Network, will give a presentation at 1pm on the Ecological Footprint framework and emerging collaboration. The National Footprint Accounts are the foundation of Global Footprint Network's Ecological Footprint accounting framework and are updated annually with the latest United Nations data sets. The National Footprint Accounts track the Ecological Footprint and biocapacity of more than 200 countries and regions. This Footprint data has been used by more than a dozen national governments to guide sustainability policy, including Switzerland and the United Arab Emirates, and many cities, such as Calgary and Vancouver. When coupled with the UN Human Development Index, the Footprint can help determine if countries are on track to meeting the UN Sustainable Development Goals. "By establishing the National Footprint Accounts at York University – a vibrant, independent, well-governed, and respected academic leader in sustainability – the accounts will become even more trusted and effective," said Wackernagel. "After spreading the use and recognition of Ecological Footprint accounting around the globe, this new placement at York will turn these accounts into an even more incontrovertible reference for public and private decision-making in support of sustainability." The goal of the partnership is to make the National Footprint Accounts even more scientifically robust and widely used. An international hub at York University will not only update the accounts, but also coordinate, among international research institutions, methodological improvements to the Footprint Accounts. 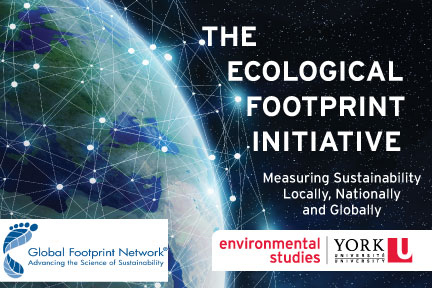 In addition to hosting the Ecological Footprint database, York University will look into developing a new graduate program to support the production of the National Footprint Accounts. Global Footprint Network is an international research organization that is changing how the world manages its natural resources and responds to climate change. Since 2003, Global Footprint Network has engaged with more than 50 nations, 30 cities, and 70 global partners to deliver scientific insights that have driven high-impact policy and investment decisions. Together, we’re creating a future where all of us can thrive within our planet’s limits.